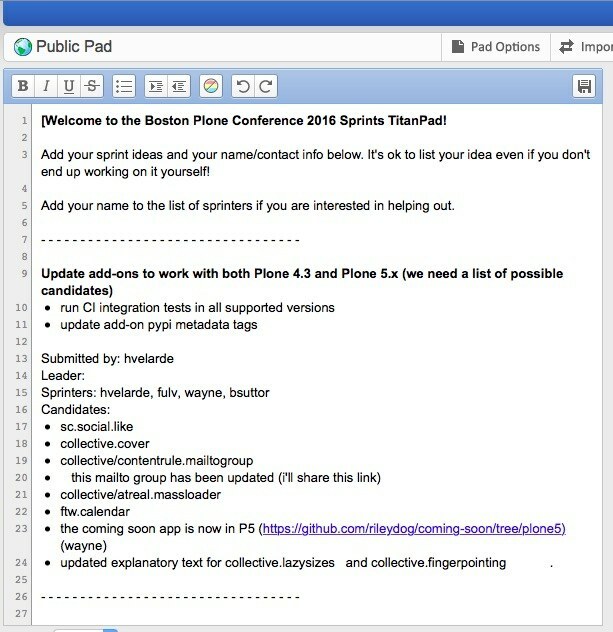 [Welcome to the Boston Plone Conference 2016 Sprints TitanPad! Add your sprint ideas and your name/contact info below. It's ok to list your idea even if you don't end up working on it yourself! Add your name to the list of sprinters if you are interested in helping out. updated explanatory text for collective.lazysizes and collective.fingerpointing . Writing Documentation to keep this package maintanable and depending packages updatable. The blob example works entirely (hence not merged). Unit tests are ok, but we are still searching the best approach for e2e.Unit tests are ok, but we are still searching the best approach for e2e. Login tutorial is done (merged in master). - try to merge early - changes in a way that they work in Zope2 and Zope4. Next steps: Create a wrapper "plone_create" which can be used to call bobtemplates.plone in a user-friendly manner. - Implemented and merged PR to remove use of formlib from GenericSetup. It's no longer a dependency of Plone! - Released zope.globalrequest 1.3 which is compatible with Python 3. - Reviewing work from the plone.server team on making plone.alterego compatible with Python 3.